Jacket is being measured and will be tailored to fit perfectly. The salesman was very cute, too! And now the Australian couple are off to the Uffizi for an art tour this afternoon, then aperitivo at a beautiful restaurant overlooking the Arno River and maybe browse in a few more shops…. Just back from the San Ambrogio Market, where I bought beautiful tomatoes, cherries, prosciutto, peaches and pecorino piccante cheese. Not pictured is the cantaloupe, zucchini and bread! I am starting to weaken my resolve to put off shopping until right before I go to the States! I did purchase some great navy blue crop pants and matching top yesterday, and a cream summer weight cardigan in a fabulous Italian design….I justify this because I am eating so much, I need bigger pants! 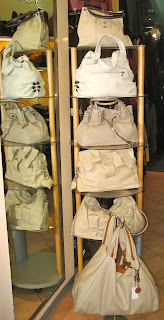 The biggest problem with my job as a personal shopping guide here in Florence is the temptations I must avoid! Like this buttery soft cream leather bag I saw yesterday. It is so lightweight and beautiful, and it smelled so good, it was all I could do to let the shop owner tear it out of my hands and put it back on the shelf. It made my old Max Mara tote look like a grocery sack! 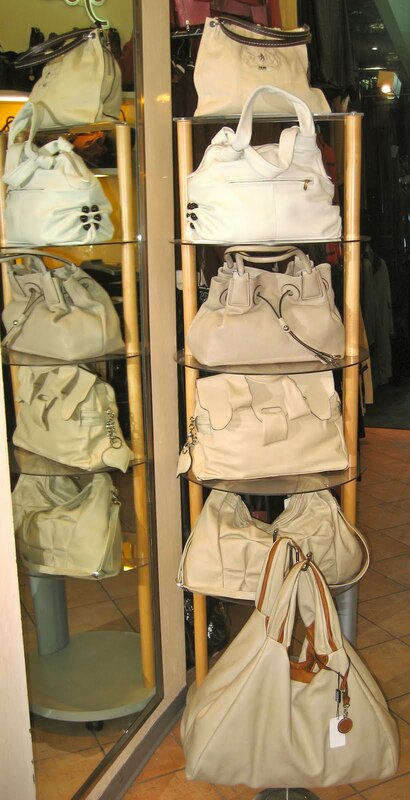 And this is just one of the cream colored bags on the display……. But I have promised myself that I will hold off making any purchases until the week before I leave. So I went to the big grocery store to get some supplies for my empty refrigerator. The pasta aisle here always amazes me. It is the whole length of the store, and the pasta is on both sides of the aisle. This photo is taken from mid point of the aisle. Someday I am going to actually count how many different kinds of pasta are available here! 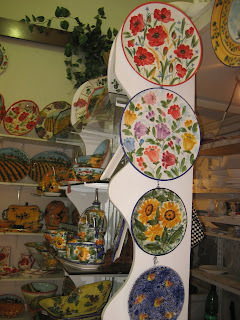 My favorite is still the San Ambrogio Market, however. I love the colors of all the vegetables and fruits. And right now, the heirloom tomatoes are so sweet and delicious that I sometimes just eat three or four of them for dinner! La dolce vita for sure! My daily language class at Scuola Parola continues to be a lesson in humility, but I am actually able to understand most everything that is said to me. This does not mean I am fluent, or capable of carrying on a philosophical discussion, however. Now that we are studying the ninth verb conjugation and all of the irregular verbs in it, my brain feels like an alphabet soup….provo sempre! Having the shopping tour business now, I feel completely justified in spending most of my free time browsing through the shops. Have restrained myself in making purchases, however. 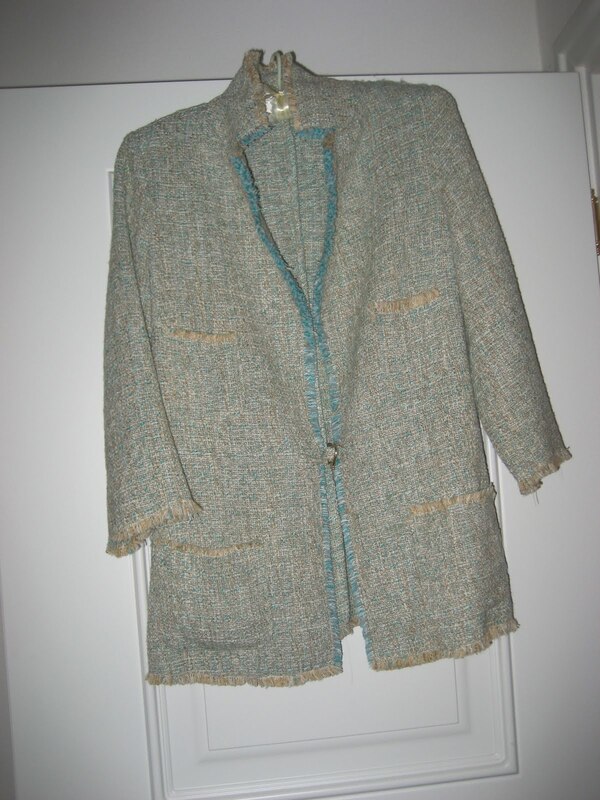 Well, that might be a little strong…couldn’t pass up this boucle jacket from a newer Italian designer, at a really good price! It was too warm to wear the jacket for my shopping tour yesterday, but I did wear the dress and shoes. 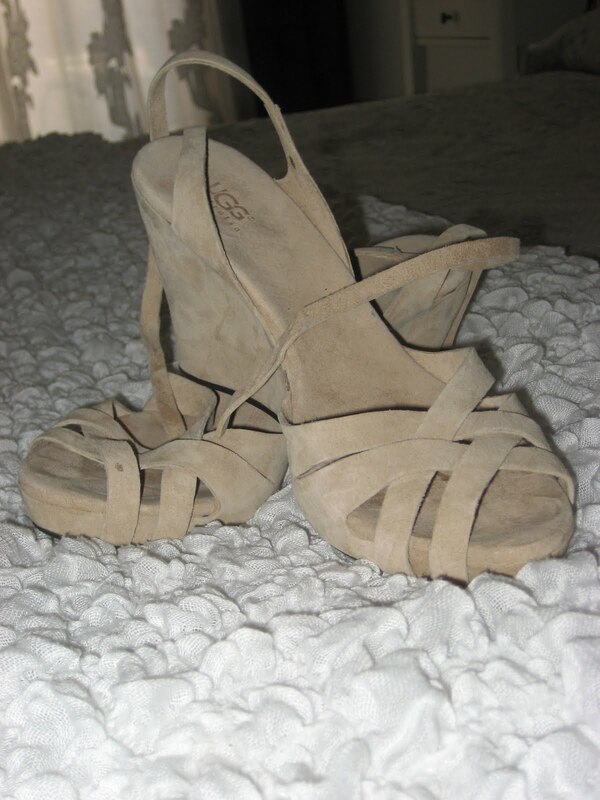 I lasted about an hour on the cobblestones in the heels before I pulled out my comfy flat sandals (I always carry a spare pair in my bag!) My client yesterday was a charming man from Manhattan who needed some help find appropriate stores here and a bit of help with selections. He bought a gorgeous gold charm bracelet for a friend, and several bottles of wine that can’t be found anywhere but here. There are only 1.000 bottles produced each year, and 800 of the bottles are grabbed right away by a man in Japan. Last week, I had several families who bought beautiful leather jackets, shoes and bags. A couple from Texas found just what they wanted in ceramics, gold and shoes. A good time was had by all, especially me! What a dream job: getting paid to take people shopping and making them happy!